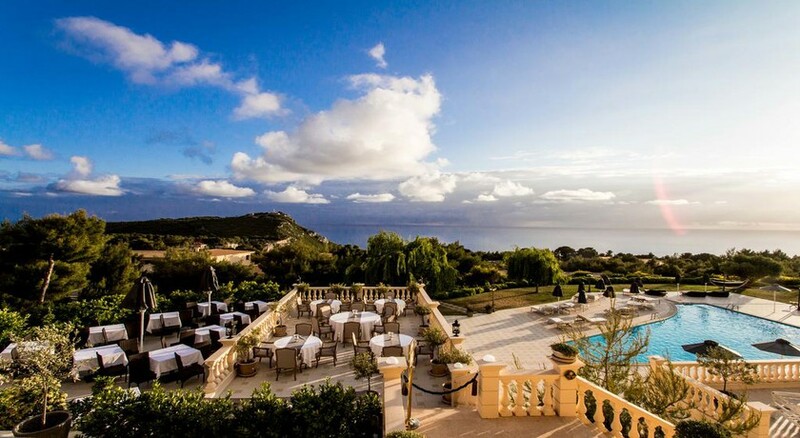 Mabely Grand Hotel is a 5-star, luxury hotel situated near the village of Kambi on the north-west part of Zakynthos or Zante. The hotel complex extends to an area of about 60,000 square meters and is located at a short distance away from some of the most picturesque places of the Greek Island. The hotel has an elegant and refined vibe to it. With interiors done up in classical Greco-Roman style, the hotel oozes sophistication and style. Each room, done up tastefully, comes with a balcony that overlooks the gorgeous cliffs of the Greek island and the seemingly endless Ionian Sea. The hotel also offers a range of first-rate amenities, including delightful restaurants and bars, football court, tennis court, health club, gym, wellness centre, shops and lots more. Guests can either enjoy a few relaxing days taking a dip in one of the 2 large swimming pools, lounging at the poolside and gazing at the breath-taking views of the Greek countryside or simply soak up the sights and sounds of the island. The hotel is well connected with most of the major tourist-friendly sites of Zante such as the Shipwreck beach, the Natural History Museum and the D. Solomos Museum, and Askos Animal Park. It is located at a distance of 29 km from the airport and roughly 15-20 km from the nearest mall, bank, pharmacy, bar and restaurant. Some of the most beautiful and historical sites such as the Mycenaean Tombs are also located nearby. Located on the towering cliff of Porto Schiza, the hotel has 108 beautifully furnished rooms, which come with balconies having stunning views of the Ionian coast. 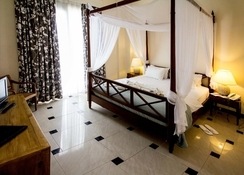 They come in four broad categories such as single, double and family rooms and suites. 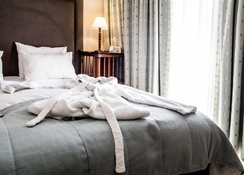 Amenities such as mini bars, safety lockers, air-conditioning, bath accessories, flat-screen TV sets and anatomically correct beds are provided with each and every room. Each guest receives a welcome fruit and/or a cheese platter. He or she can request for in-room dining, massages and private airport transfers as well. The hotel has web check-in options as well. There are a variety of bars and restaurants at Mabely Grand Hotel that can satisfy the taste buds of even the most finicky of all eaters. The main restaurant Lydia has breath-taking views apart from the scrumptious food served at either buffets and dinners throughout the day. The lounge bar, Noire, has a nostalgic feel to it and is decorated with colonial memorabilia. Another a la carte restaurant called the Advantage serves authentic Greek cuisine. The pool bar serves a variety of drinks and low-calorie snacks. Finally, hotel has the option of dining in rooms as well. The hotel has a world-class beauty and fitness centre, offering a range of beauty treatments and massages. There are multiple-day programs, involving a range of treatments, which have to be booked at an advanced date. On the other hand, a custom-made beauty treatment program can also be designed upon request. For active individuals, the hotel has jogging tracks, a gym, biking routes, a 5x5 football court, badminton, volleyball and table tennis facilities. The hotel has two giant pools, where guests are provided with free sun shades, towels and sun beds. It also has a number of private pools in its executive suites. The swimming pool below the annex building also has a bar, which serves delicious snacks and welcoming drinks during a specific period of the day. The Wi-Fi is only available & free in the lobby area. The hotel offers a mini-market & agricultural shop. Pets are allowed only upon request with an additional daily fee. Only the honeymooners (they should bring their wedding certification) receive a bottle of wine & a fruit platter in their rooms upon check in. Fab , chic hotel , great facilities and the food is of a very high standard too. All staff except one lady at reception were very helpful and friendly . Really enjoyed our holiday, it was a good break away from all the noise and busy life. A chance to slow down and relax. It wasn't perfect but it was very good. It's not near a beach but it's not near lots of noise and smell and people constantly trying to get you to spend your money. It's away from everything in it own little patch of calm. That said i did miss the beach... The island is not very big so it's easy to get to interesting places. The food was good but could have been better with a live cooking station doing fresh fish or steak etc. The drinks were very good all international brands and good wine. The evening entertainment was much quieter than other places, which i liked. Lovely hotel, very grand in parts. Pools very relaxing and plenty of sunbeds and lounges. Friendly and helpful staff. Good quality drinks and a nice selection of foods every day. This hotel is set away from the hustle and bustle which suited us. You need a car really to get out and about.